AKRR'05 conference will be held at Helsinki University of Technology, in Otaniemi, Espoo, Finland. The address of the conference site is Otaniementie 17, Espoo and the conference building is called "TUAS-talo". Espoo is the second largest city in Finland. City of Espoo is located west of Helsinki and is part of the Helsinki metropolitan area. There are two different kinds of taxis at the airport: regular and airport taxis. Regular taxis are rather expensive (approximately 40 euros to Otaniemi) but take only 15-20 minutes, or 30 minutes during the rush hour. Taxis to downtown Helsinki from the airport are about as expensive as a ride from the airport to Otaniemi. Airport taxi usually takes several persons at a time (with different destinations) and is therefore slower but also less expensive (20 euros per person). If you wish to use public transport, there is an express bus (Finnair) from the airport to the main railway station in downtown Helsinki. Regular bus line number 615 from the airport to downtown Helsinki is also available. A single ticket costs 3 euros 40 cents. Buses from downtown Helsinki to Otaniemi leave from the Kamppi bus terminal. The new terminal, opened on 5th of June, is about half a kilometer to the west from the main railway station. Lines 102 and 103 go directly to Otaniemi in about 15 minutes. You can also use bus lines 194 and 195, which are slightly slower taking a northern route. A map and more specific information on getting to Otaniemi you can find at http://www.tkk.fi/Current/getting_to_otaniemi.html. To travel by bus from downtown Helsinki to Otaniemi, you need a regional ticket ("seutulippu" in Finnish). Single regional ticket costs 3 euros 40 cents. Single tickets can be bought from the bus driver. By clicking "Show route" you are given a map of the route. By pressing "SHOW SELECTED ROUTES" you can more detailed information on the journey. The system also provides you with the walking routes and times. The system is particularly useful if you are looking for a route between two more distant locations within Helsinki region. 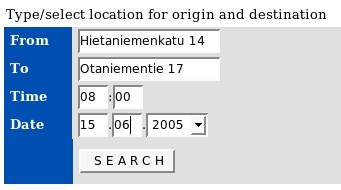 You can also choose the origin and the destination from the map. The address of the conference site is Otaniementie 17, Espoo and the conference building is called TUAS house. The conference site, TUAS house, is indicated by number 37 in the map at http://www.tkk.fi/Current/otaniemi_map.html. Get Together event is organized on Wednesday, 15th of June in the Computer Science and Engineering building in the address Konemiehentie 2 that is indicated in the map by number 30. These two buildings are located next to each other. The registration desk can be found in the ground floor lobby of the TUAS house building. The main conference halls are AS1 and AS2. The bus line 103 from Helsinki city center has one stop just about 100 meters from the conference site. Those who live in Radisson SAS hotel that is located in the Otaniemi region have a 15-20 minutes walking distance to the conference site. Radisson SAS hotel is located next to number 28 on the map.